The core components of all body fats are fatty acids. Their production is initiated by the enzyme ACC. Researchers at the University of Basel's Biozentrum have now demonstrated how ACC assembles into distinct filaments. As the researchers report in Nature, the type of filament formed controls the activity of the enzyme, and thus fatty acid production. Fats are highly diverse molecules that serve as fuel and energy storage, and they constitute the building blocks for cell membranes, hormones and messengers. Despite the diversity of fats, all the fatty acids arise from the same precursor. A single enzyme initiates its production: acetyl-CoA-carboxylase (ACC). ACC is therefore the linchpin of fatty acid synthesis and understanding its architecture is critical for treating many diseases. 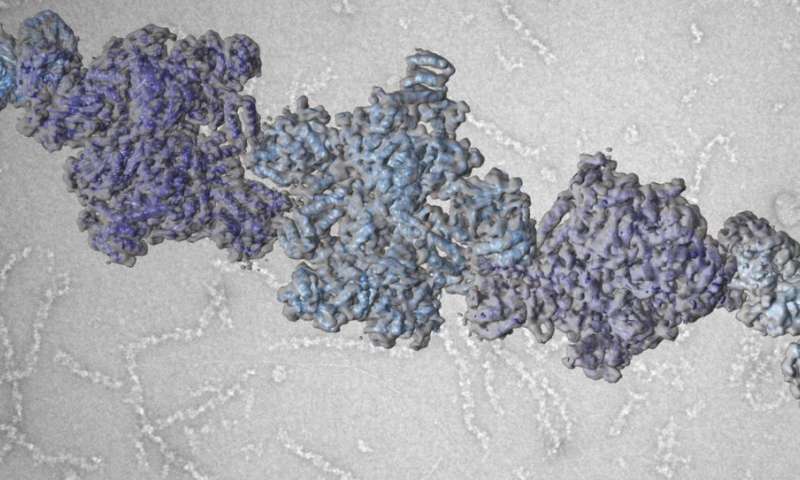 While the enzyme and its function in metabolism have been known for nearly 60 years, scientists have understood very little about the structure of ACC. In fact, modern biochemistry textbooks continue to show old and blurry pictures of filaments formed by ACC, leaving the how and why of filament formation an enigma. Now, a team of researchers led by Prof. Timm Maier from the Biozentrum of the University of Basel has sharpened the picture. "We have solved this long-standing puzzle in metabolism," reports Maier. "Elucidating the detailed architectures of ACC filaments revealed their impact on enzymatic activity."